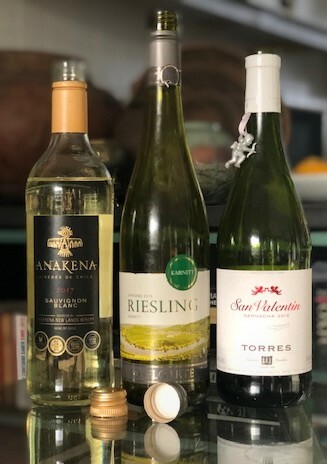 Summer made a tentative return to the Western Cape last week (though as I write it is dull and cloudy again, albeit warm enough), sufficiently for me to resume my quest for good value, cheapish foreign whites at the supermarkets. Not Pick n Pay, which is pretty pathetic when it comes to foreign stuff, and the Constantia Woolworths has a surprisingly small wine section – with one Italian pinot grigio unenterprisingly representing Europe’s whites. So, to Checkers once more, but it proved difficult to find three I wanted. A German Riesling was a must-try, and a reader had recommended the Chilean sauvignon blanc so I gritted my teeth and took that. But the white Côtes-du-Rhône was vintage 2015 and the colour was showing very developed through the clear bottle, so I suspected it was well past its best, so no. There was an Australian sauvignon blanc, but one was enough (of all things, why have two sauvignons in your small collection of foreign wines in South Africa?). And another bloody Italian pinot grigio, at which I baulked, full of prejudice (well, post-judice really). Anakena Sauvignon Blanc 2017 (like the Australian Cab-Shiraz I wrote about last week) has travelled an enormous distance to get here, being produced in Chile and bottled in the UK. Talk about carbon footprints…. Typically fresh and juicy, well balanced and not too acidic, it’s got a nice earthy note and is more cape-gooseberryish than a local is likely to be, so it offers a pleasant change, I’d have thought – and at a mere R50 seems good value to me. It was quite a leap of aromas and flavours and structures moving from northern Europe cool-climate refinement to the generous, sensual richness of Torres San Valentin Garnacha 2016. The bottle doesn’t give an origin more precise than “Spain”, but the Torres website says Catalunya (Catalonia), and also suggests that there might be some admixture of other varieties. It’s a very pleasant wine, with a nice little grip of ripe tannin and sufficient acidity; some warmth from the declared 14% alcohol. No real fruit depth, but totally satisfactory and recommendable – though only after spending the same sort of money on the Marras (and Ken Forrester) versions, which I think I’ll stick to. But I have convincingly made the discovery that no doubt many readers have arrived at long before I got round to it: In a situation of drought, Checkers (with the selection advice of Michael Fridjhon) really is doing local imbibers a great service through its range of modest foreign wines, judging by what I’ve tasted. I intend to explore more – and I wish some of our grander importers would do likewise and start doing a bit of searching rather than relying on the established names, so as to bring us more wines of this quality at this sort of price. Because they’re not doing so now.